Who is Considered to be a First-time home buyer? In order to be considered a first time home buyer, you must not have had ownership in a home in the past 3 years. Do first-time buyers need a down payment? There are some programs that require no down payment, such as VA and USDA loans. However, these are not restricted to first-time homebuyers. There is no type of loan specifically for first-time buyers that does not require a down payment. Which loan is best for first time home buyers? There is no one size fits all home loan for first-time buyers. But the most popular type of home loan used by first-time buyers is FHA loans. This is because of their low down payment requirement and most relaxed guidelines to qualify. 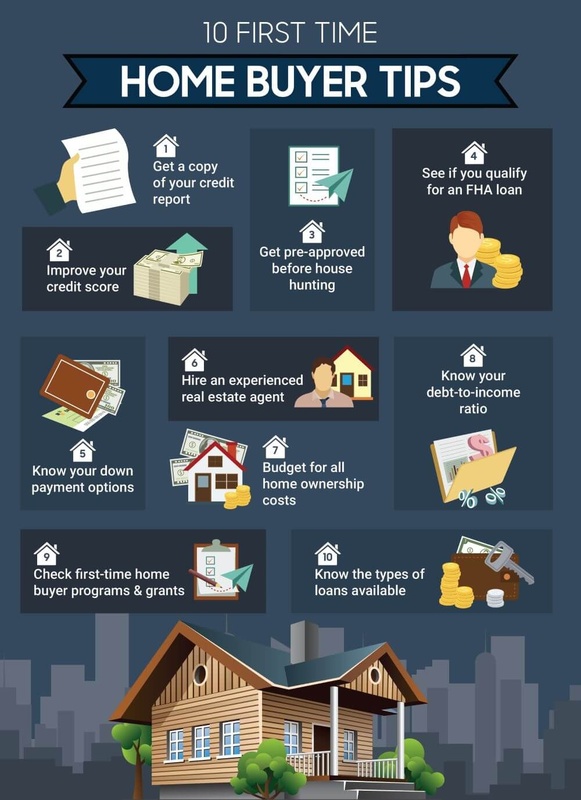 What credit score do I need for an FHA loan? The Federal Housing Administration will ensure a mortgage if the borrower has a 500 or higher credit score and a 10% downpayment. If a borrower has at least a 580 credit score they will ensure the loan with just a 3.5% down payment. In Conclusion… Buying a house for the first time doesn’t have to be scary, follow these 9 tips and make sure you work with a great realtor and loan officer and the process should run smoothly. Check your credit score, hire a good realtor, compare loan offers from multiple lenders and don’t apply for new credit during the home buying process. As long as you follow all the tips in this article you can achieve the American dream without any headaches.